eM Client email client has a built-in spell checker that checks the spelling of words typed when composing email messages and engaging in chats. In addition to eM Client built-in dictionaries, users have the ability to add words that default dictionary doesn’t recognize to dictionary. Sometimes, you may accidentally or mistakenly click or tap on “Add to Dictionary” when wanting to correct wrongly spelled words. eM Client does not provide a user interface to edit, manage or delete custom words in dictionary. As such, you need to manually delete words that wrongly added into dictionary, as outlined in the following tutorial. Locate a file named <language code>.custdic. For example, if you’re using US English dictionary for spell checking, the file name is en-US.custdic. Optional: Make a backup of .custdic file. Open the .custdic file for editing with any text editor such as Notepad. Remove any keywords that you don’t want dictionary to remember, such as wrongly added misspelled words. 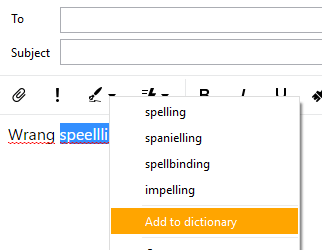 You can also edit the spelling of the words, if you need the custom words in dictionary but just want to edit the spelling.